We musicians categorize our audiences based on age group and demographics. At one glance, you can usually tell which group they belong to. Is it possible to get to know them individually? What is the point of asking people to RSVP if you can’t hold them to their word? One of the fundamental tasks of revenue management is capacity management. This is something airlines are good at. They deliberately overbook so that all seats get filled. Last time I organized a seminar, I did not bother to ask people to RSVP. Respondez si vous plait. I was filled with nerve-wracking trepidation, growing as the event got closer. What if only a few people showed up? What if too many people showed up? Last minute, I changed to a bigger room. A good move. Around 35 people showed up. For today’s seminar, I asked attendees to reserve their seats by filling out a short survey. When the numbers didn’t fill as quickly as I expected, I sent a round of e-mails through another mailing list. A few people e-mailed me their plans to attend instead of filling out the survey — they did not show up. Filling out the survey unfortunately did not oblige the attendees to show up. While the majority of those RSVP’d did show up, there were a few cancellations. In hindsight, I would have saved time creating and monitoring the survey by not requiring RSVP. There has to be a more reliable way of gauging the final turnout. How do we get people to hold to their RSVP? What is the point of requiring RSVP when people can show up without prior reservation, and those who do reserve can not show up without penalty? This phenomenon happened early on in the Monument House Concert Series. I decided that I had to demand prepayment as a condition of booking. No show – no refund. After all, revenue management was more important than capacity management. If the revenue stream was certain, then we’d breakeven and have a peace of mind. In conclusion, requiring people to RSVP is an extra step for them and yourself. Think carefully whether it’s necessary. For today’s seminar, not only did I get a rough headcount, I also got questions in advance. Dr Chong Kee Tan’s High Note Live, is a new kind of concert management system for booking artists, inviting guests, and confirming attendance. 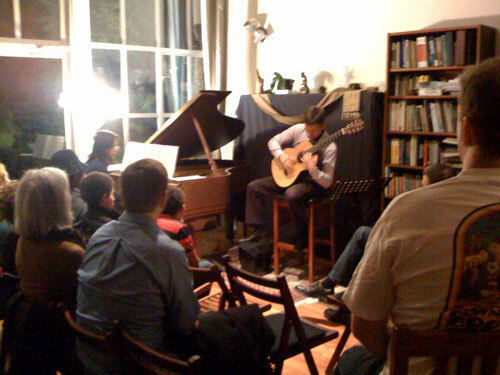 Bekkers Piano Guitar Duo used it for their loft apartment concert in San Francisco. Our concert in a loft apartment in San Francisco was an experiment in a new kind of concert booking and reservation. The host and I used a bespoke web-based software under beta test to book the performers (our piano guitar duo), invite guests, interact, specify number of seats and amount of payment, and confirm through payment. This web-based mechanism is called High Note Live conceptualised and developed by the multi-facetted and multi-talented Dr Chong Kee Tan. How does one book an artist for a performance? How does one keep track of an artist’s popularity or reliability? How does one invite guests and ensure they show up? How does one guarantee an artist a certain income before the concert begins? How do different stake-holders in the run up to a concert track how many people are attending? In my 14-page paper (PDF) on “house concerts for art music,” I specifically describe the different stakeholders: owner of the concert venue, concert host, concert producer, performer(s), guests, collaborators, sponsors, patrons, etc. They each have their own interests and needs. A successful concert is one that meets everyone’s expectations. From one perspective, producing a concert is a risky business. To remove the risk, the concert producers needs to ensure what is expected to happen will happen. Those people who said they wanted to come to the concert actually do. The performers would prefer to know beforehand whether the venue is filled and whether they will get paid what they expect. In essence, how does one get a peace of mind? These were the questions that led Dr Tan to research the market for software that would help concert producers, be they house concerts or bigger venues, to achieve greater efficiency and minimise risk. High Note Live removes the stress of tracking various e-mails between different counterparties, i.e. between the different stakeholders. In the week of our loft concert in San Francisco, I saw the number of attendees go up until there were no seats left. What a great feeling! Without such a central system, we resort to disparate ways to invite people to a concert: Facebook event (but not everyone is on Facebook and clicking ATTENDING does not oblige one to attend), LINKED-IN announcement, e-mail invitation, phone calls, face-to-face, and paper invitation. The confirmation process is also iffy. People don’t always say what they mean or mean what they say. How do you oblige someone to show up? Make them pay. Use it or lose it. That’s how airlines fill up their seats. That’s how concert halls fill up their theatres. An empty seat is a disappointment and a failure to fill it. Watch this space for future updates to this new concert management system.